LIGMA ransomware uses sophisticated techniques to infiltrate computers and hide from its victims. Use Reimage to determine whether your system is infected and prevent the loss of your files. 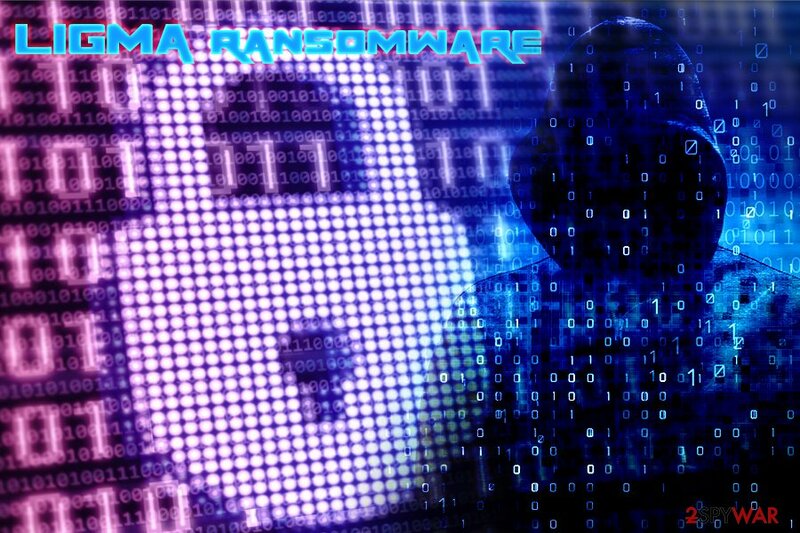 LIGMA ransomware is a new infection that showed up in September 2018. Thousands of Crypto-viruses are developed for money extortion from its victims. However, this cyber threat is different – it functions as a wiper, meaning that file recovery is not possible via the ransom payment (crooks don't even ask for it). Nevertheless, the malware encrypts data using the AES-256 encryption algorithm and appends .ForgiveME file extension. LIGMA ransomware is designed for Windows 7 x86 users and creates a path in C:\ WinWOW32 and the Temp folder, inserting files LIGMA.exe, Payloads.dll, work.bat, mbr.bin, and quite a few others. It is not known how the cyber threat is distributed, but it is most likely to spread via contaminated spam email attachments or links. Additionally, hacked or malicious websites, as well as file-sharing ones, are highly likely to be used for LIGMA ransomware distribution. As soon as the LIGMA ransomware payload modifies system and personal files, it forces a Blue Screen of Death. After the reboot, victims realize that they cannot access their computers anymore. The reason is that the virus modifies not only personal files to encrypt them, but also cases a PC crash and messes up the Master Boot Record (MBR), which prevents the machine from starting correctly. Therefore, victims don't even get a chance to remove LIGMA ransomware from their computers. It does seem like LIGMA ransomware authors are trying to mock its victims, announcing that their files, together with the Windows OS cannot be recovered. Unfortunately, it is true, and LIGMA ransomware removal is impossible. It is hard to tell why bad actors use such malicious programs t inflict the maximum amount of damage, as they do not receive anything in return. However, the experimental viruses like these are often used for testing purposes, or to gain some negative fame online. That is why keeping backup is so essential when it comes to ransomware infections. While some more prominent crypto lockers are decryptable by now, some less-known viruses like LIGMA might never be researched by experts, simply because the infection volume is too low. While researchers might find a way to fix the MBR in the near future, the files will remain encoded until decryptor is created. Therefore, to recover from the wiper attack, users will have to reinstall Windows entirely. To make sure that all the traces are gone users should scan their machines with Reimage and repair any damage that could be caused by the LIGMA virus. Most users have probably found a spam email in their Inboxes by now. While some phishing messages are reasonably easily recognizable, there are some that come around that even the most computer-savvy individuals might fail to notice. Hackers often use clever social engineering techniques to persuade users to open the infected attachment or click on the malicious link that would download and execute the payload automatically. Therefore, always take precautions when checking your email. Most of the providers have a built-in scanner that checks messages for scams. However, quite a few of them can bypass the protection and end up in the users' inbox. Thus, do not casually open attachments – scan them using an updated anti-malware software first. LIGMA ransomware removal might be impossible since computer entry is denied. If, however, in some way you will manage to enter your machine, you should reboot it in Safe Mode with Networking and perform a full system scan using Reimage. Security software will get rid of the infection, and you can then use backups to recover your files. If you can't access your PC, there will be no way to remove LIGMA ransomware virus without reinstalling Windows operating system. It is a wise idea to upgrade to the latest version of Windows, as it provides more security from cyber attacks. Log in to your infected account and start the browser. Download Reimage or other legitimate anti-spyware program. Update it before a full system scan and remove malicious files that belong to your ransomware and complete LIGMA removal. When a new window shows up, click Next and select your restore point that is prior the infiltration of LIGMA. After doing that, click Next. Once you restore your system to a previous date, download and scan your computer with Reimage and make sure that LIGMA removal is performed successfully. Guide which is presented above is supposed to help you remove LIGMA from your computer. To recover your encrypted files, we recommend using a detailed guide prepared by 2-spyware.com security experts. LIGMA ransomware functions as data wiper. Thus, recovering data without backups is almost impossible. Nevertheless, if you will manage to enter your computer, use the below third-party programs to attempt file recovery. If lucky, maybe at least some of your data will be saved. Data Recovery Pro is typically used to get back files that were accidentally deleted or corrupted in some other ways. Fortunately, some users reported that the application can sometimes recover files that are modified by ransomware. This method will only work if you had System Restore function enabled before the virus attack. ShadowExplorer is an excellent tool if the LIGMA virus failed to delete Shadow Volume copies. ^ Tim Fisher. What Is a Master Boot Record (MBR)?. Lifewire. Tech Untangled. ^ NoVirus. NoVirus. Cybersecurity experts. ^ Margaret Rouse. Remote desktop protocol (RDP). SearchEnterpriseDesktop. All things desktop management- and security-related . This entry was posted on 2018-09-18 at 06:47 and is filed under Ransomware, Viruses. You can quickly scan the QR code with your mobile device and have LIGMA ransomware manual removal instructions right in your pocket. How did you remove LIGMA virus?